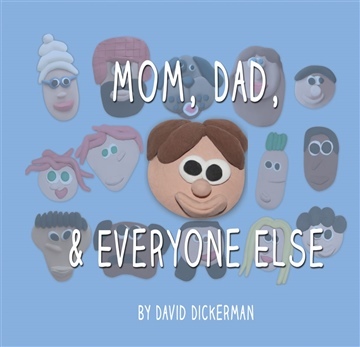 In Mom, Dad, & Everyone Else, author David Dickerman creates a story about divorce with a primary use in bibliotherapy. However, unlike many children’s picture books that tend to focus on the negative and inherently sad elements of a family falling apart, David’s focus is on an often overlooked positive side. This positive side centers around the child’s world expanding via exposure to new people who love and support him or her while also bringing in new experiences that otherwise may remain elusive. Using an innovative blend of clay based characters and scene elements with bold, solid and colourful background illustrations, Mom, Dad & Everyone Else brings an engaging, safe and playful visual feel to a story that tackles the emotionally complex world of divorce. David holds a BA in Psychology from Syracuse University as well as MS. Ed degrees in both general childhood education and literacy from Bank Street College in New York City. He works and lives in the Philadelphia area with his wife, son and dog, Norman. He began working with children at a young age as a camp counselor and in after school programs. These experiences, coupled with his post secondary educational focus, well prepared David for his multi-faceted career as a teacher, program director, literacy specialist and educational consultant. It was the combination of personal experience and professional expertise and experience that led David to develop and write Mom, Dad and Everyone Else. Mom, Dad and Everyone Else is among the children books that attempt to draw out the potentially positive aspect of the otherwise difficult and negative situation that is divorce. In David's own words, "I wrote the book based on personal experience with the intention of using it as a tool to convey the positive side of a difficult situation. My parents had a messy divorce and with all the acrimony involved, I could not see the positives until after the dust had settled. My family of 4 had grown exponentially and I was exposed to things that I would not have been exposed to before. I realized that out of tragedy could come formative experiences that make you a stronger individual."